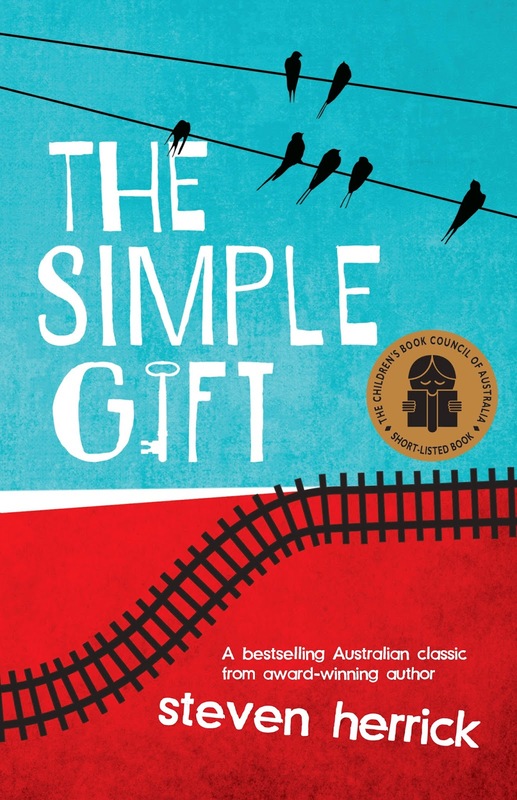 Thirteen years after it was first published, UQP is pleased to announce a special reissue of the bestselling and award winning Australian classic, The Simple Gift, from the master of free verse, Steven Herrick. My hand in his stops trembling, for a moment. Written in verse, The Simple Gift is about a sixteen-year-old boy named Billy who escapes the violence of his father’s home for a life of no fixed address. In the town of Bendarat, he meets a homeless man, named Old Bill and Caitlin, a seventeen year old girl from a privileged background. Each carries their own personal baggage and find themselves united by their search for meaning in an increasingly soulless world. Over early mornings, long walks and cheap coffee they discover, no matter how big or small, it’s the simple gifts in life that really make a difference. Billy Luckett has packed his meager possessions, stolen the last of his father's alcohol, cigarettes and is out the door. He won't be back, he's rather be sixteen and homeless than to set foot in that filthy house again. Goodbye Longlands Road, goodbye Wentworth High School and good riddance to Nowheresville. When you're a runaway, the world is your oyster. But no one stops on the highway, no one wants to give a sixteen year old boy a ride out of town, so when a coal freight train is heading to someone other than where you are, you jump at any chance to leave your life behind. Bendarat good enough a place as any, and Billy soon finds his home in an old abandoned railway carriage. Life on the streets is quickly teaching Billy to be resourceful, that leftover scraps at McDonalds are the difference between starving and living to fight another day... Which is where he meets Caitlin. Caitlin works at McDonalds, not that she needs to. Her parents provide her with anything she needs, never needing to want for anything. She sees Billy beyond the rumpled clothes and eating the leftovers of a stranger, but for the well mannered young man who always has a smile for her. Something she wants to see more of. Billy meets old Bill at the old rail yard, stumbling along to the carriage he calls home when old Bill drops his beer. Rather than walk away, Billy extends a hand of friendship, with his dad's carton of cigarettes. Old bill has been living at the rail yard since 1994, the day he lost everything. He drinks away his life at a slow and steady pace. Three different lives that have all crossed paths, each one finding solace in one another and finding their place in the world. Have you read it too Dre? It was amazing wasn't it. I'm trying to hunt down a few more of his titles to check out, if this one is anything to go by. Ooh free verse? That is something I wanna try! It was phenomenal Melanie, I've never read anything like it. So few words, but so powerful. I don't know if I've tried books written in verse before...I read Out of the Dust by Karen Hesse, which I think (??) is verse? I liked it, though! So this is definitely worth a shot for me! I haven't either before this one, but my goodness it was good. I can't believe how emotional and powerful a storyline can be with so few words. I'll have to check that one out. I've heard interesting things about The Simple Gift and it really intrigues me with it's format of written in verse and everything. Glad you enjoyed this Kelly! Lovely review as usual. Jeann, you need to read this one. It was just brilliant! I only ever imagined verse as a form of poetry, not an actual storyline. It was incredible.